Studying the laws of the Red Heifer: Getting Ready For The Future! JERUSALEM (JTA) – No praying. No kneeling. No bowing. No prostrating. No dancing. No singing. No ripping clothes. These are the rules that Jews must abide by when visiting the Temple Mount, the site where the First and Second Holy Temples once stood, located above and behind the Western Wall in the heart of Jerusalem’s Old City. Although the area is under Israeli sovereignty, the mount — known to Muslims as Haram al-Sharif — is controlled by the Islamic Wakf, a joint Palestinian-Jordanian religious body. As the site of the Al-Aqsa Mosque and the Dome of the Rock, whose golden dome overlooks the city, the Temple Mount attracts daily crowds of Muslim worshipers. Under Wakf regulations, Jews may only access the mount for 4 1/2 hours per day and are forbidden from praying there. But when Rabbi Chaim Richman stands only feet from the Dome of the Rock, surrounded by Muslim visitors, he whispers a chapter of Psalms. On previous visits to the mount, Richman says he’s sung the entire Hallel prayer under his breath. 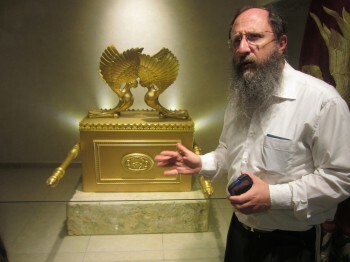 A frequent presence on the mount who knows the guards by name, Richman is the international director of the Temple Institute, an organization based in the Old City with a singular goal: to rebuild the Holy Temple in Jerusalem. Ahead of Tisha b’Av, the fast day next week that commemorates the destruction of the First and Second Temples, the institute released a video showing Jewish children donning tool belts and leading their fathers out of synagogue to begin construction of the Holy Temple. 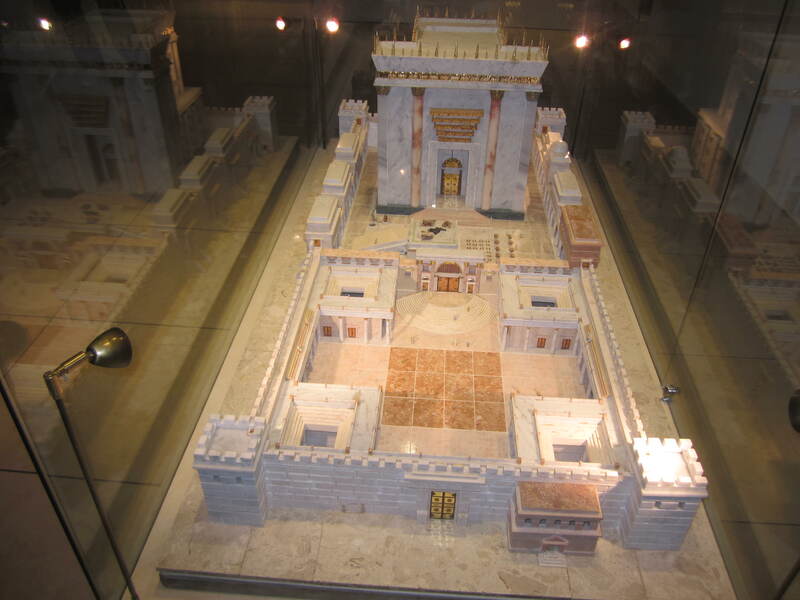 Following the Second Temple’s destruction in 70 C.E., most rabbis adopted the position that Jewish law prohibits reconstructing the Holy Temple prior to the age of messianic redemption, or that the law is too ambiguous and that the messiah must come first. The Temple Institute takes a different position. “There are no Jewish legal barriers” to rebuilding the temple, Richman says, only political ones. The institute isn’t shy about advocating what many see as a radical goal: replacing the mosque at the Dome of the Rock with a new Jewish Holy Temple. A painting in the institute’s exhibition depicts this scenario, with the city’s light rail line taking residents to the Temple Mount. The Temple Institute is dedicated to laying the groundwork for this vision. The organization has formulated a program for where the temple will stand and what its vessels will look like, aided by 20 men who study Temple law full-time. The products of this research — 40 ritual objects — are on display in Plexiglas cases at the institute’s headquarters in the Old City. Silver trumpets to be blown by priests and a wooden lyre are perched next to two deep pans with long handles — one for collecting blood from small sacrificial offerings and another for large sacrifices like the Passover lamb. 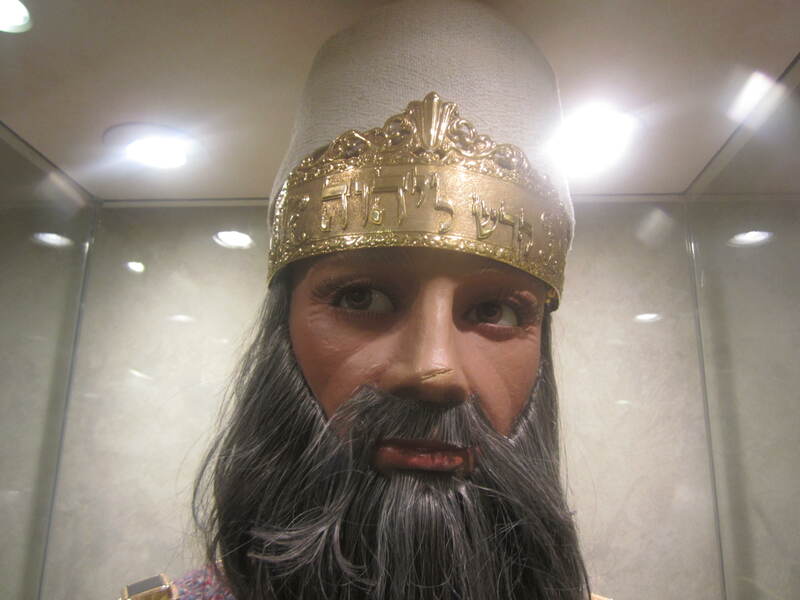 In another room, mannequins with beards wear the respective vestments for deputy priests and the high priest. The high priest’s outfit, with azure weaves, gold thread and a breastplate with 12 precious stones, took 11 years of research and $150,000 to complete. Next to it stands a massive 12-spigot sink with electric faucets — technology that Richman says will be permitted in the Third Temple. 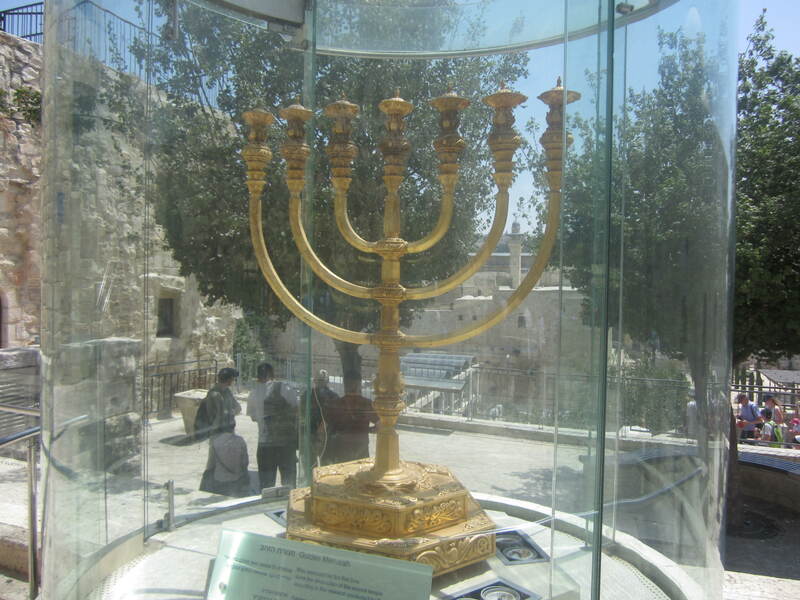 The institute’s crowning achievement — the Temple’s golden, 200-pound, seven-branch menorah — stands outside in a case overlooking the Western Wall. Unlike art or history museums, the institute’s goal is to remove the objects from their cases and bring them to the mount for use as soon as possible. Many Israelis view the goal as a danger to the status quo that has kept this site holy to Muslims and Jews from turning into a tinderbox. In 1984, Israel’s security services stopped a group of Jewish terrorists conspiring to blow up the mosque at the mount who reportedly got very close to achieving their goal. Ever since, authorities say they have kept a close watch on any attempts to disturb the peace on the mount. Though observant Jews pray thrice daily in the Amidah prayer for the Temple to be rebuilt, few do anything about it. That’s as it should be, says Michael Melchior, an Orthodox rabbi and former Knesset member who is considered a religious moderate. Given the obstacles to breaking ground on a Holy Temple, the institute also has taken up a more modest cause: expanding Jewish rights on the Temple Mount to allow unrestricted access and prayer. In that endeavor, Richman is joined by several right-wing Knesset members and a group of archaeologists who say the Wakf is reckless with archaeological remains at the site. Richman says support for the institute’s goals is growing. For him, the issue involves far more than politics, archaeology or even Jewish legal research. The Temple Institute, he says, is doing God’s work. To place a prayer in the Western Wall, click here. To view a live cam on the Western Wall, click here. “From the time the daily sacrifice is stopped and the sacrilegious object that causes desecration is set up to be worshiped, there will be 1,290 days. “The day is coming when you will see the sacrilegious object that causes desecration standing where he should not be.” (Reader, pay attention!) “Then those in Judea must flee to the hills. “Known to God from eternity are all His works. Then I was given a measuring stick, and I was told, “Go and measure the Temple of God and the altar, and count the number of worshipers. But do not measure the outer courtyard, for it has been turned over to the nations. They will trample the holy city for 42 months. 687 AD A mosque, the Dome of the Rock, is built and remains today. At the southern end of the platform stands the silver-domed al-Aqsa Mosque. For Muslims, the same place, Haram-al-Sharif, which means Noble Sanctuary, is the third holiest site, after Mecca and Medina. Muslims believe that the prophet Mohammed made a miraculous night jounrey from Mecca to this place, and from there ascended to heaven.